is an Egyptian film critic, programmer and script supervisor. 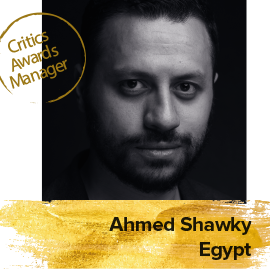 Shawky writes film criticism for regular publications and platforms including Al Kahera newspaper, the FilFan entertainment website and the Goethe Institute’s e-magazine. In-between covering film festivals around the year, he has found time to publish four books about cinema: Taboo in Egyptian 80s Generation Cinema; Helmy Halim: A Story From Here and filmmaker conversations with both Daoud Abdelsayed and Yousry Nasrallah.